I got that lead-balloon feeling on Sunday when our pastor pointed out all the things Paul didn’t pray for in his letters: people with cancer, busy schedules, promotions at work, successful ventures, hard pressed finances, strained relationships…. Not that those things don’t matter, or that we shouldn’t pray for them, or that God doesn’t care about the minutiae of our lives, but they weren’t on the apostles regular prayer card. It raised the old question for me again: why do I always find my prayer list filled with immediate needs, when I know that matters like the Kingdom come, His will be done, missions, justice, global worship etc are weightier and worthy of prayer? Why is it that when I do sit down to pray (and my struggles with that are lengthy and complex) I pray for the “light and momentary afflictions”, and so seldom for the eternal things? I don’t have an answer for that, but this weekend I found one little word which is helping me close the gap between the daily-needs-prayer and the weightier-matters-prayer. God, thanks for a lovely, sweet season in my marriage. Rather than saying “thanks, keep it up, make it better”, please Father, make it count. Help us to be thankful and still work hard at our marriage, not leaving prayer for the tough times alone. Let this good season count. God, money is tight for so many dear ones. Everything in me wants to ask for more, to make it better. But please Lord, make these tight days count. Teach us to be wise stewards, teach us to give generously now while we feel hard pressed, teach us to pray for daily bread, and to learn the secret of contentment whether we have plenty or little. Make these days of economic hardship count. God, I’m at my wits end with my kids. They won’t eat, sleep, poop or obey as I’d hoped they would. I want it to be better, please Lord… I know you can make it better, but instead I will pray “make it count”. Help me to be patient with my slow to learn kids, as you are patient with slow to learn me. Help me to show love to them in their immaturity, as you show love to me in mine. Lord, make these trials in parenting count: let them teach me and my children what YOU are like as a parent. Make these long days of relentless loving discipline count. Please, please, please… Make it count. I like this idea, and I will be adding it to my prayer life. Thanks! Beautiful and well timed, as I have been trying to really focus on my prayer life, an often neglected but essential part of being. Just because Paul didn’t mention things in his letters doesn’t mean he didn’t do them. Coming to God as a type of fix-it man is wrong, of course, and praying for things to be done in ways that count for his kingdom is a good prayer point. But I would hesitate to say that Paul never prayed for a sick friend to feel better, etc. The author DID make a point of saying, “Not that those things don’t matter, or that we shouldn’t pray for them, or that God doesn’t care about the minutiae of our lives, but they weren’t on the apostles regular prayer card.” She is not saying we shouldn’t pray for them at all. That is not the point of her article. I might suggest, most of those mentioned, did not exist back in the day’s of Paul. Bron, I secretly keep up with you via your captivating blog and I must say the timing of this particular blog is perfect. Thank you for being willing to be used of God to bless, change, challenge, encourage, and convict others through your own life experiences. I am still learning so much from you, even these 8+ years later.. May God answer your prayers in unimaginable ways! Jen, I’m so glad you came out of hiding 🙂 i stalk you on fb, you know… thanks for your encouragement! This is so good!! I am glad I made an effort to open the link.Thank you Jenny. Love you my friend. Thank you for your kind words, Monica. I found this very insightful and helpful. The concept of prayer is one that I really grapple with. Thank you for writing this post. Thanks, Matt. It’s a grappling zone for me too. Yes!!! Oh, how I love this! I always pray with my kids at night and wonder how I could redirect from the “list”. In love it. Yes… amen. The best boss I ever worked for used to pray this. It started when he was a teenager and he prayed, ‘Lord make my life count.’ Years later, he was still praying, ‘Lord make this year (or week or day) count.’ He was a powerful very Godly man, used much by the Lord and a big influence on my life. Great post Bronwyn. Thanks. ah, nice. i have been struggling with the idea of prayer lately and “so what if i pray for the ugandan girls, it’s not going to bring them back” and “i prayed for my best buddy with cancer and it went away but now it’s back” and so on… but this helps… it doesn’t give all the answers but it definitely helps… thankx a lot – great focus to have! Thanks a lot – this post counted. Thank you so much for these words – so incredibly powerful. Gosh, yes. Amen and amen. 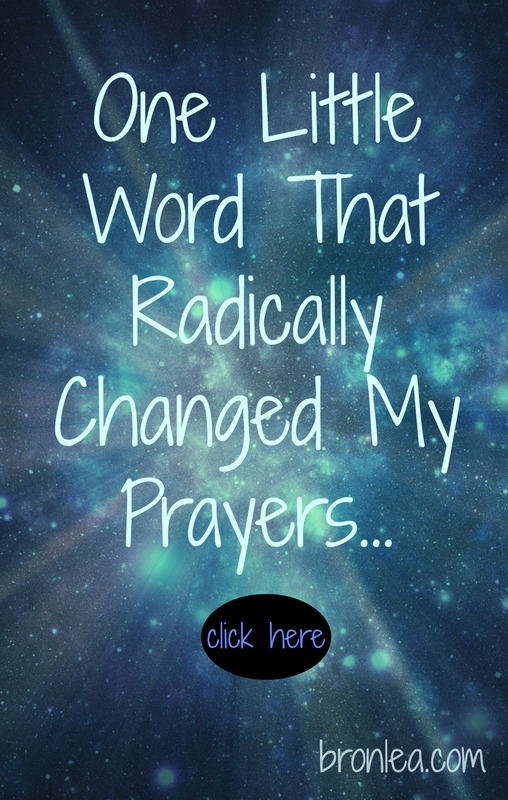 Your post revolutionized my thinking about prayer. Thank you for sharing your thoughts! Good stuff! Thank you for sharing. I totally agree, but have a hard time with this. Needed to hear it again! I have a hard time with it too! It’s funny how many times I’ve come back to re-read this post. May God make it count for you, too. Thanks for reading. What a great article! Great perspective change! I will be incorporating this into my prayer life for sure! Thank you for sharing! This is a perfectly timed article for me. I often feel so overwhelmed when praying just as you said. This is a really great way to be reminded to fully rely on God’s over all plan for all of us. Thank you. I really appreciate your post. Nice reminder! Love it! Thank you for sharing Bronwyn! I am so glad that my cousin shared this on FB. It has brought out a new element to prayer. I will be adding that to my prayers as well. Thank you so much. Good stuff! I use Jesus’ prayer in the garden as a model: Please take this cup from me, but not my will but what you want. I often pray, Father please heal my daughter, but if this isn’t what’s best, help me accept your will and grow as I trust you. I lost my husband to brain cancer last week. 32 months ago as we sat in the ER and heard he had a mass in his brain, he said, “God can be glorified in this too.” That is how he lived and prayed in the months to follow. Beautiful and goes right along with a group of women I meet with on Tueday night for bible study. We have taken up the challenge to pray Col 1:9-12 for each other and ourselves. Usually we get bog down in the temporal things to pray about and never get to the heart issues which is most needed. Going to share this post with all, thank you. Along the same lines, and more directly scriptural is “whatever you do, do it to show your glory. Our prayers need to be focused on God’s glory, not so much our comfort. There’s a sermon there, but I’ll leave it at that. Thank you for this post. Yes, I’m here a bit late since its publication, but if you only know how this is exactly “for such a time as this”. This is such a beautiful concept! I have been reminded recently of 1 Thessalonians 5:16-18 “Rejoice always, pray without ceasing, in everything give THANKS…” This puts new perspective on being thankful, not just for what He has done, but what He is doing! Just stumbled across this old post and it is so amazingly on point for me right now, TODAY… as we grapple with hard times. Praising God for using your post to speak to me. Thanks Bronwyn! This has given me something to think about, thank you. Emma, truth be told I come back to this post every couple of months because I invariably find myself in a difficult, challenging, painful and selfish place, and I need to be reminded, too! Thank you so much for your kind words: I am so grateful that God leads us to people and words to lift our heads along the way. God bless you. 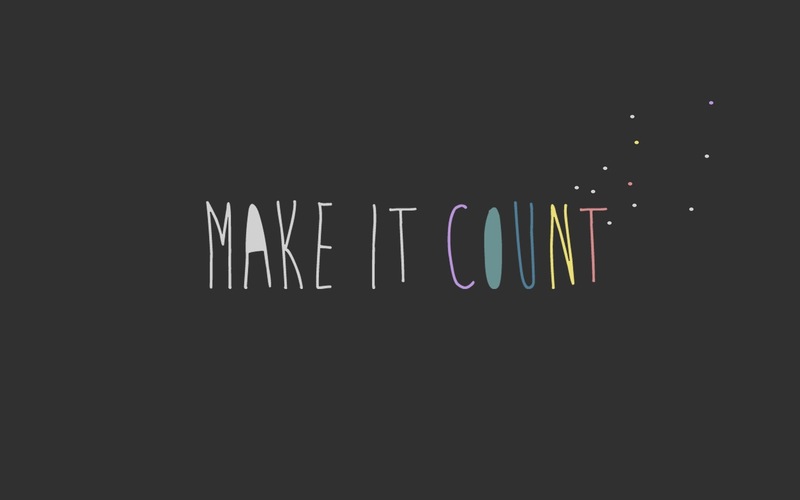 ‘Make it count’ – such wise words. Sometimes all I can manage is ‘Oh Father’. Adrian Plass, a british writer, once got a message from the Lord from an anglican priest, when he was going through a particularly painful time. All the Lord said was ‘Adrian, nothing is wasted’. All the pain and suffering meant something, and will mean something. If you havent read any of Adrian Plass’s books Id recommend him. It’s been years since I read Adrian Plass: what a great reminder 🙂 Thanks! Pingback: Love Led Me Here | Make it…..